"My work revolves around images suggested to me through relationships and dreams." Duncan Regehr reaches into the depths of psychology and the unconscious to convey penetrating observations of humanity and the evolution of social consciousness. His labor-intensive technique  layering many textured combinations of oil pigment  provides both luminescence and visual depth. At the same time, it makes everything in the painting equally important and significant. 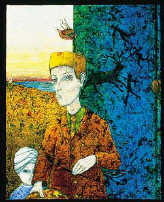 His figures  colorful, flamboyant, mysteriously introspective  come from, and focus on, unseen worlds. Sometimes they appear to be caught on stage, posing for an invisible audience. Regehr brings forth his subjects, trying many combinations until, as he says, "they arrive." Duncan has a website at www.duncanregehr.com/.